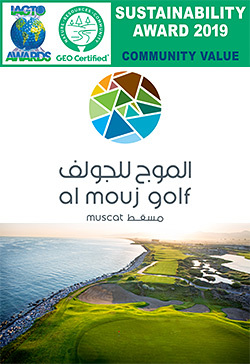 Al Mouj Golf, Oman, 18 October 2018: Al Mouj Golf has been awarded the IAGTO Sustainability Award for Community Value at the 2019 IAGTO awards, as their efforts to benefit the local Muscat area continue to be recognised. The winning of this award is testament to the sustainable practices in place at Al Mouj, recognising their vision of utilising golf to benefit future generations and follows its receipt of international GEO Certified® accreditation in 2017. It was the first course in the country to achieve the latter distinction, which came courtesy of its dedication to nature conservation, social inclusivity and resource efficiency. “It is with great pride that we accept the IAGTO Sustainability Award for Community Value; an outstanding accolade which represents the tremendous efforts we, as one of the region’s leading clubs, have taken a lead in implementing,” said Mubarak Hill, Club Manager, Al Mouj Golf. One of the most significant initiatives for which the club was praised is the re-naturalisation of the land surrounding its fairways. The ‘out of play’ areas around Al Mouj have been designed to blend with the desert surroundings in an effort to conserve the biodiversity and natural habitats of Muscat wildlife. Indigenous birds have benefited greatly as a result, with an abundance of species being found in and around the golf course. Furthermore, Al Mouj works outside of biodiversity to be sustainable by focussing on reducing water usage. To do so, it has redesigned its irrigation system to use treated sewage water, rather than fresh water, on the course. A recent sprinkler head audit also reduced water consumption by 100,000m3 per year. In terms of community engagement and social inclusivity, the club has raised over $100,000 through its Fore Autism charity golf days, also driving increased awareness of their cause. Casual golfers of all abilities have also been invited to begin their golfing journey at Al Mouj, with the club implementing flexible golf days and membership categories. In partnership with the Environmental Society of Oman, Al Mouj has also worked to engage its visitors, members and staff to promote the club’s sustainability initiatives and reassert their importance to the local community. Jonathan Smith, GEO Foundation Executive Director of the IAGTO awards, said: “For its outstanding charitable work and social inclusivity programmes, Al Mouj Golf in Muscat, Oman, wins this year’s Community category for demonstrating just how beneficial golf can be to local people and tourism, and how valuable the game is to businesses in the greening of the industry’s supply chain. “Annual charity events for autism helps raise significant money and awareness; flexible golf days and membership categories make golf available to all; coaching and junior programmes encourage the next generation of players; multi-functional facilities place golf side-by-side with other healthy pursuits and lifestyles; and supporting local farmers with native vegetation waste for camel feed – all of which makes Al Mouj a clear leader and champion for sustainability in golf. To find out more about Al Mouj, visit: www.almoujgolf.com and follow @AlmoujGolfOman on Twitter.